14k gold filled earrings of small white coin pearls. Available in white, grey and pink pearls. Each pearl is about 8 mm. Handmade in the USA. 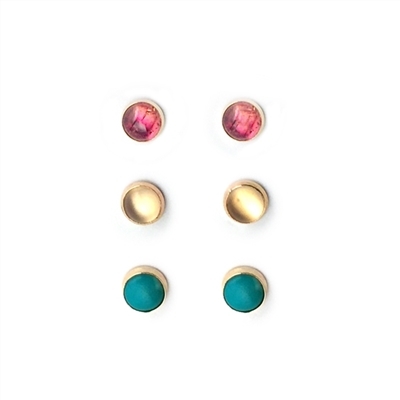 14K Gold-filled stud earrings with 6 mm bezel set gemstones. Shown in rainbow moonstone. Surgical stainless steel posts and butterfly ear nuts. 14k gold filled earrings of coin pearls. 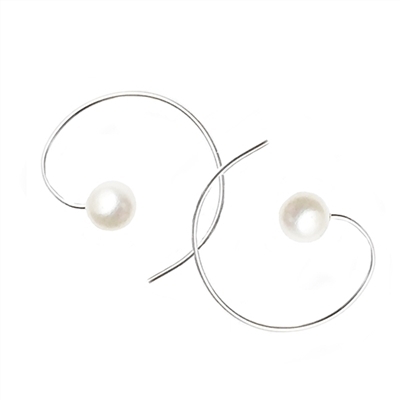 Available in white, grey and pink pearls. Each pearl is about 12mm. Handmade in the USA. Faceted nugget shaped stones on 14k gold filled lever back earwires. 3/4" inch in length. Handmade in the USA. Blackened sterling silver earrings with bezel set opal gemstone cabochons and faceted iolite briolette. 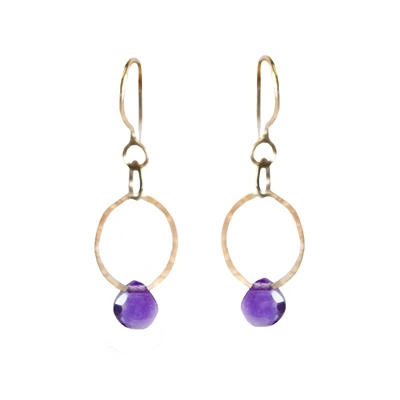 Long colorful stone earrings in 14k gold filled. 2" inches in length. Handmade in the USA. 14k gold filled earrings with natural agate slices. Available in carnelian or Montana Agate. 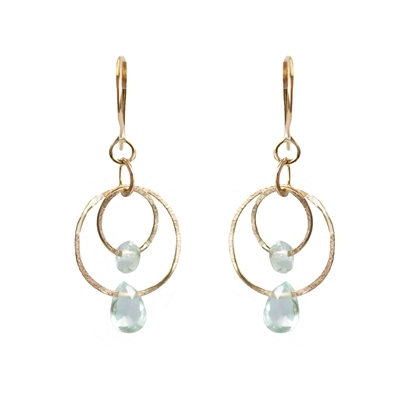 Earrings of a gently hammered 14K gold filled loop with faceted briolette. Shown in amethyst. Small prong set gemstone post earrings in 14k gold filled. 14K gold filled earrings with faceted soft rectangle gemstones. 14k Gold Filled earrings with a briolette and faceted rondelles. Each earring is 1" inch in length. Handmade in the USA. 14K gold filled earrings of simply beautiful natural gemstones. Shown in natural opal and available in many gemstones. 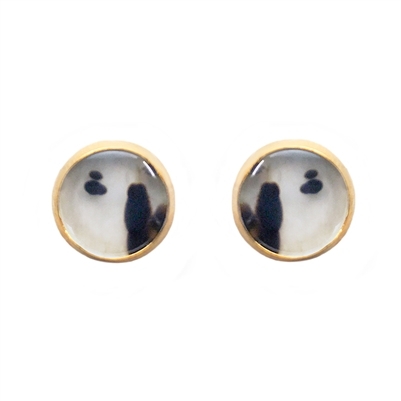 14K gold filled stud earrings of prong set cabochons. 14K Gold filled lightly hammered double loop earrings with faceted briolette. 14K Gold-filled stud earrings with 10mm bezel set gemstones. Shown in Montana agate. Surgical stainless steel posts and butterfly ear nuts. Approx. 3/8" inch in diameter. Ethiopian Opal briollettes on 14k Gold filled Lever back Earwires. 14K gold filled earrings with 3mm gemstone cabochons. Large faceted Green Moss Agate and 14K yellow gold-filled earrings. 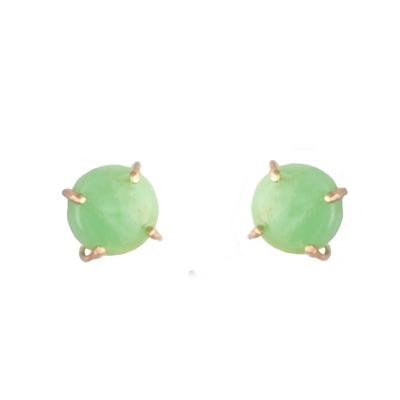 Each Green Moss Agate is about 20mm and each earring is 1 1/4" inch in length. Handmade in the USA. 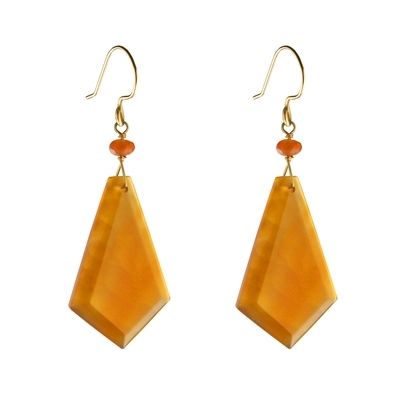 14k gold filled earring of large faceted Peruvian chalcedony drops. Large smooth teardrop earrings in 14k gold filled. Each earring is 1 1/4" inch in length. Stones are 18x13mm. Handmade in the USA. Faceted 12mm (1/2") Teardrops on 14K Gold Filled Lever back earwires. Smooth teardrops of natural gemstones on 14k gold filled lever back ear wires. Shown in rose quartz and available in kyanite or white moonstone. Each earring is 1 1/4" inch in length. Handmade in the USA. Faceted cushion cut stones on 14K Gold Filled lever back ear wires. 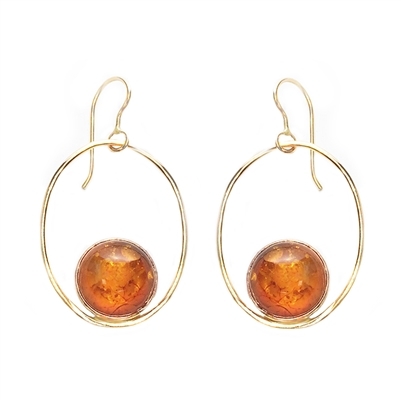 14k yellow gold filled earrings with hand faceted natural gemstone rondelles. Each earring is 1 1/2" inches in length. Handmade in the USA. 14k gold filled earrings with free form natural gemstone pairs. Available in carnelian or Montana agate. Hoop earrings featuring a 12mm (1/2" ich) gemstone cabochon in either 14k gold fill or sterling silver. 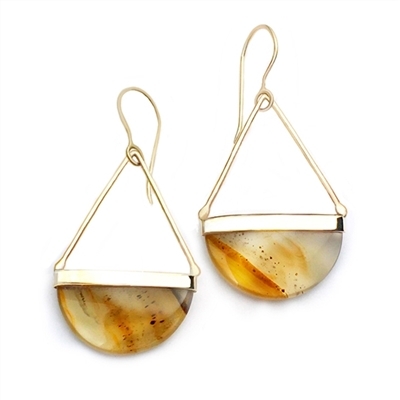 Shown in Amber and available in an assortment of natural gemstones. Approx. 1 1/2" inch in length. Long 14k gold filled earrings with smooth natural gemstone drops. Shown in Montana agate. Approximately 1 1/2" inch in length. Handmade in the USA.